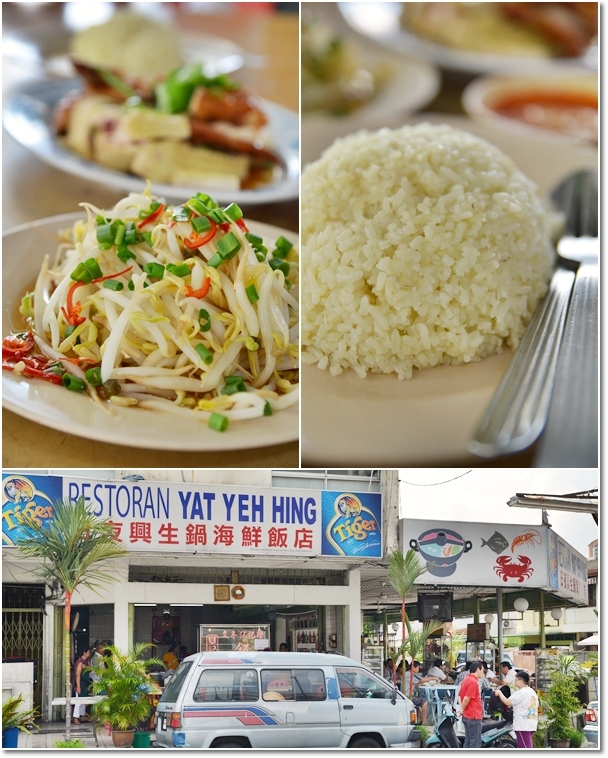 If you’re in PJ, and don’t fancy going to Ampang, or even Solaris Dutamas for Loke Yun’s famous chicken rice, try Kee Kee Bentong Chicken Rice at Yat Yeh Hing Restaurant in SS4; immediately before the Kelana Jaya exit on LDP. Freshly grated ginger every morning, and a sweetish chili sauce came together in harmony; a perfect blend of flavours to accentuate the taste of the chicken. 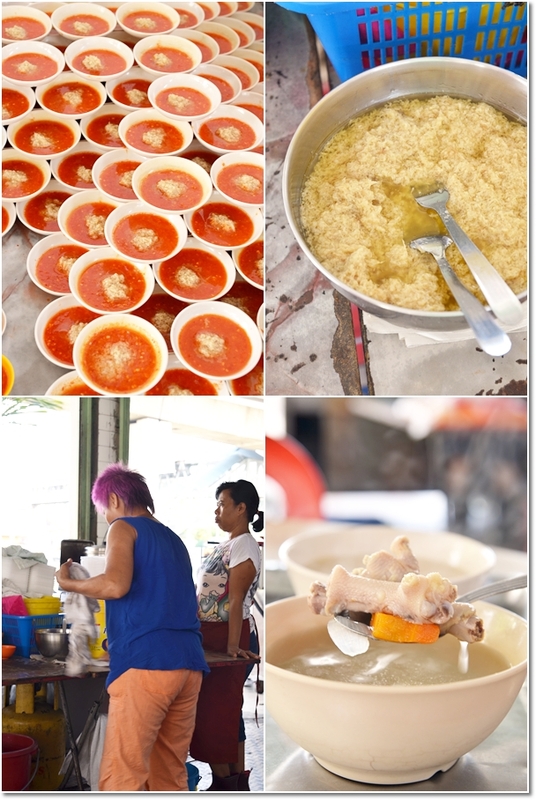 The soup with chicken feet is self-served, hence don’t rely on the 7-odd workers there. A platter of mixed roasted chicken and poached chicken; should be half a chicken for two pax. 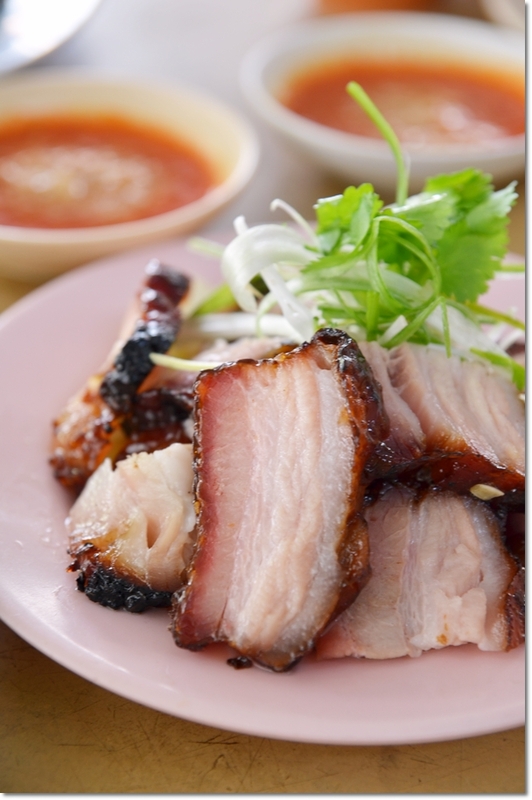 A jelly-like texture of the yellow skin provided a wobbly crunch without the unpleasant soft bits of fats underneath. 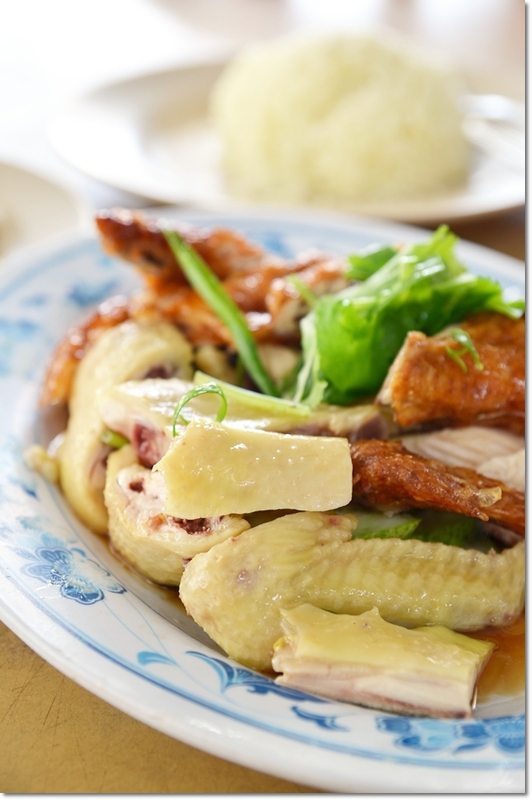 The skin of the chicken is generally more yellowish because the chickens were fed with corn in the farm in Bentong. We arrived 5 minutes shy of 11am. To push our luck, since most hawker stalls were not opened during the odd hours between breakfast and lunch. We went rounds in Damansara Jaya to no avail … as the renovation/demolition of Wisma Atria left the workers around the area with NO alternative option to park their vehicles. 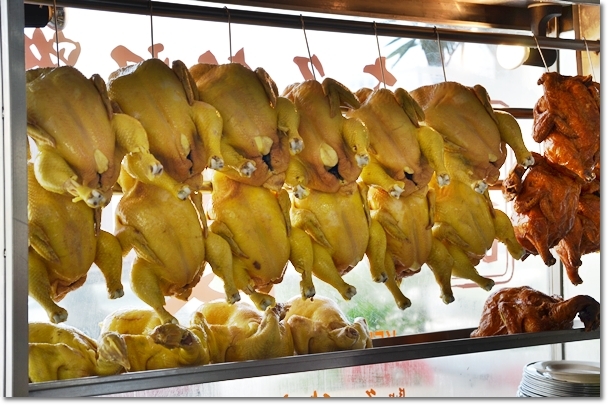 This stall at Yat Yeh Hing had this unwelcoming appearance initially, with NO chicken at all hanging from the glass display counter. Succulent and sticky cuts of pork barbecued to a caramelized finish; the charred bits at the ends were crispy with a smoky aroma imparted from the fire (presumably charcoal-fuelled), and the almost inseparable layers of fat and lean meat got me sinking my teeth with relish. I mean, if I could not separate the fats from the lean, it lessens the guilt, no? But the staff kept beckoning us to go in. There were already a few tables seated and waiting for their food. Only then, I saw the staff hurriedly carrying dozens of chicken from the kitchen on hooks, towards the front counter. And the chopping started almost immediately …..
– Just act nonchalant and don’t back off. Unless of course… he was brandishing a weapon in front of your face or sheer anger/unpleasant look on his. – Just admit that you’re a food blogger and you love sharing good food with the readers. If the name sounds familiar, this restaurant doubles up as a ‘dai chow’ Chinese restaurant at night. They used to serve steamboat, but seemingly they have stopped according to the chicken rice stall ladies. Verdict? Above average. The corn-fed chicken was tender; the poached one being slightly more impressive than the roasted counterpart. Since the roasting/bathing with oil process might have affected the delicately firm texture of the flesh. The chili sauce with freshly-grated ginger was a winner in my books. None of the other stalls come close, so far. The oiled rice was just okay, being neither here nor there. Loke Yun‘s version was top notch when it comes to the rice, in my opinion. The fat bean sprouts got me suspicious over their origin; could not have been sourced locally. And my doubt was proven to be in place. They got the bean sprouts from Ipoh; the land of “tauge”, so to speak. Certainly a place that I will find myself returning time and again, given the acceptable distance from my place, and the abundance of parking around the vicinity. They have been around for more than a decade though, previously operating from somewhere across the road. 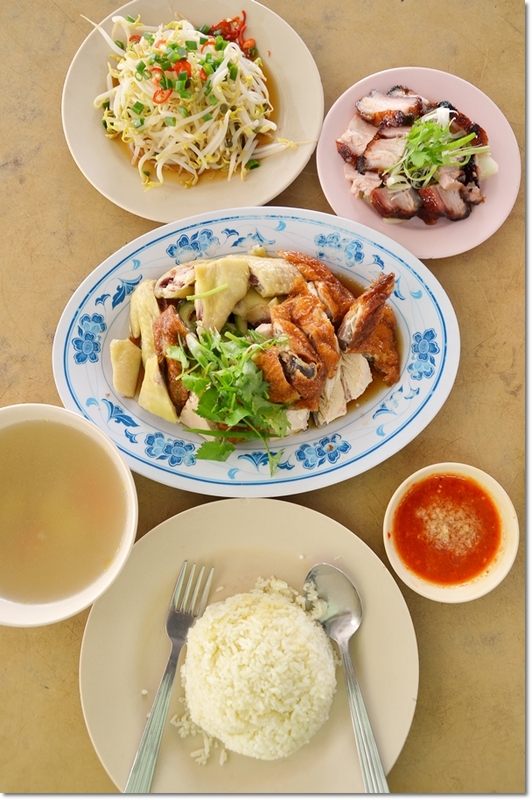 Only for lunch though, so don’t push your luck if you seek for chicken rice during supper hours. Lunch came to about RM18/USD6 for two pax, the char siew was from another stall at RM5/USD1.70 per portion, refills of chili sauce and ginger is FOC only if you reuse your own saucer plates. Opens from 11am – 3pm (or until everything’s finished) daily. Closed on one Tuesday per month. * Almost directly opposite of the church on LDP, a junction before the Kelana Jaya exit if coming from SS2/Taman Megah’s direction towards Puchong. After passing by the Kelana Jaya LRT Station, stay to the left and once you see a row of shops on your LEFT, slow down and turn left at the junction. The restaurant can be seen from LDP itself. Haha … nolah, but he was rather apprehensive in the beginning. Maybe thought I was from media or some auditing bodies. Hi William ….. I told him it wasa MY interest to take photographs. As always. But did not mention about his stall going to be featured here.